Michael I twice reigned as King of Romania, first as a boy in 1927 until his father seized the throne in 1930 and once again in 1940 when Carol II was deposed until 1947 when he was forced to abdicate by Communist leaders. At a young age, Michael’s life was already marred by personal struggles, turning him into the stoic, staid moral leader whom Romanians later accepted, loved and revered. Although he lived most of his life in exile, his love for his country never wavered, thus, earning him a spot in the hearts of his countrymen. Perhaps, his most lasting legacy was when, at the age of 22, he toppled Hitler’s puppet dictator, thus, saving the lives of thousands of Romanians at the height of World War II. Throughout his lifetime, Michael has held numerous distinctions. He was the only man to have preceded and succeeded his father as king, the youngest person to become king during his generation, the last monarch behind the Iron Curtain to abdicate and the last surviving person to have been head of state before World War II. Michael was born on October 25, 1921, at Foișor Castle, Sinaia, Romania, the only child of then Crown Prince Carol of Romania and Princess Helen of Greece. His grandfather, King Ferdinand I, thought his own son would only ruin the monarchy that he and his beloved wife Queen Marie had worked hard to place in stability. 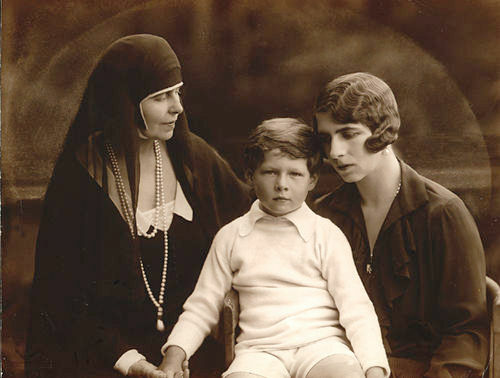 In 1925, Carol, already notorious as a womanizer and for his volatility, eloped with his mistress Elena Magda Lupescu and renounced his rights to the throne. Thus, Michael was declared heir apparent. King Ferdinand died in July 1927; at the age of five, Michael was already King of Romania. The little boy was confused when people kept calling him “your majesty”. Since Michael was a minor, a regency council was set up to rule on his behalf. The regents included his uncle, Prince Nicolas, Patriarch Miron Cristea, and the country's Chief Justice Gheorghe Buzdugan, and from October 1929, Constantin Sărățeanu. However, the council proved weak and in 1930, with the country on the brink of the Great Depression, Carol returned to the country at the behest of politicians who were dissatisfied with the Regency. Parliament proclaimed Carol as King while Michael was relegated as Crown Prince with the title "Grand Voivode of Alba Iulia". Carol was determined to keep Helen out of the scene and install Elena Lupescu as the first lady of the Court. He forced his former wife into exile and only allowed her to see their son two months every year. Neglected by his father and separated from her mother, Michael grew up desolate with utmost hatred towards Elena. Thus, the boy became a reticent young man struggling with his speech and confidence. When Michael turned 18, he took his seat in the Romanian senate, as provided by the 1938 Constitution. Shortly thereafter, Carol abolished the constitution which ultimately led to his downfall; he was overthrown in 1940 by a military government led by the fascist Ion Antonescu and his “Iron Guard” regime. Barely a man, Michael was proclaimed King but despite his position as head of state and commander in chief of the military, Antonescu treated him “like a child,” disregarding him in the affairs of state. 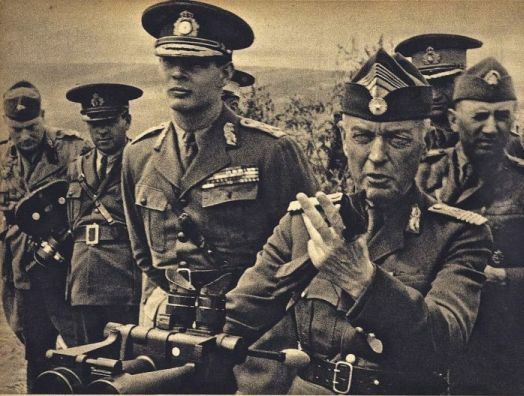 In fact, Antonescu and Hitler – whom Michael reluctantly met in December 1941, noting that he “howled like a savage”—took the young Romanian king too lightly thinking he was too young to rule. King Michael’s position was in a very delicate state. While personally, he harbored loyalties to the West, Romania formed an alliance with Germany and with the Axis. With this, his country was attacked by the Allied forces, which included a daring, low-level 1943 mission by U.S. bombers against key oil facilities in Ploesti that were feeding the German war machine. By 1943, the “puppet king” thought he had to do something. And so together with his mother, he did what he could to save Romania’s persecuted Jews. 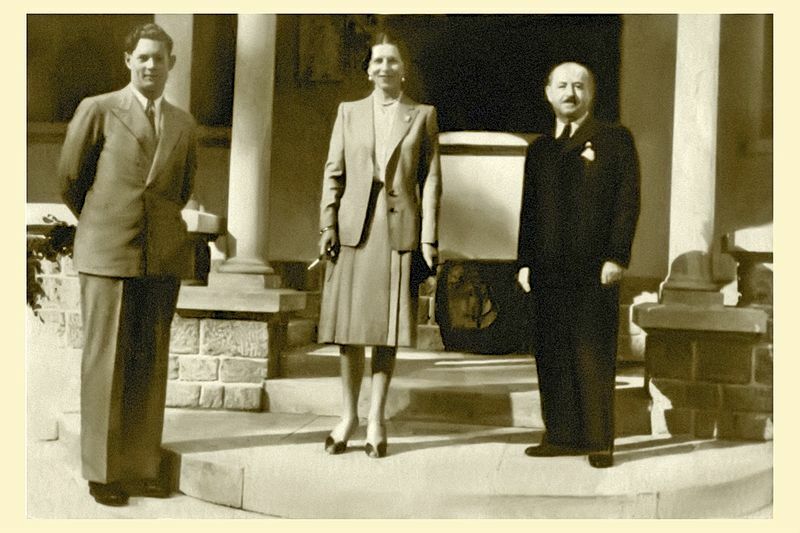 Decades after the war, King Michael told Radio Free Europe that Princess Helen—whose influence spanned from Antonescu to Romania’s chief rabbi — saved more than 100,000 Jews from being deported from Romania (Deletant, 2013). “She managed to stop a very nasty thing that was being prepared in Bucovina, and she managed somehow to get Antonescu to stop a part of that -- the deportation of the Bucovina Jews to Transdniester,” the king recalled (source). When it all seems that the king was helpless, he discreetly collaborated with the Allies. In 1944 he rallied a small group of Romanian politicians ready to risk a coup against Germany. In August 23, King Michael, a number of army officers, and armed Communist-led civilians locked Ion Antonescu into a safe and seized control of the government. This act nearly cost the king’s life. A day after, Germans bombed the Royal Palace but lucky enough Michael was not inside. The king then restored the 1923 constitution and issued a cease-fire just as the Red Army was penetrating the Moldavian front (read here for more details). Antonescu was eventually executed after he was found guilty of war crimes, including the death of Romanian Jews. For his courage the King was awarded by the Soviet Union with the diamond-studded Order of Victory, the country’s highest military honor. He was also decorated with the Legion of Merit by U.S. President Harry Truman. With the toppling of Antonescu Michael hoped that democracy would return to Romania. But the worst was yet to come. The elimination of Nazi forces only hastened the Red Army’s advancement in Romania. Little did the king know that the Allies brokered a deal: Joseph Stalin would have 90% say in Romania in exchange for Britain having 90% say in Greece. More or less 130,000 Romanian soldiers were transported to the Soviet Union where they died in prison camps. After four years with the Nazis it became clear that Michael had to contend with the Soviets. “Unfortunately, I had four years with the Nazis and three years with the Soviets, and you get to the point — how should I say — you have radar in your nose,” he summed up his short but tumultuous reign (source). In 1945 a British foreign official noted: “Michael is the only person who may be able to pull the country through the coming months and save it from anarchy or communism.” However, things were not under the king’s control. In March 1945, he was forced to appoint the pro-Soviet Petru Groza, dubbed as the “Red Bourgeois,” to lead the country. The West’s failure to help exasperated the king but he was not the one who would be easily intimidated. He went on a “royal strike,” refusing to sign any royal decrees in the hopes that London or Washington would intervene. In November 1947, King Michael visited London to attend the wedding of his cousins, the future Queen Elizabeth II and Prince Philip. The Communist leaders saw this as an opportunity to plot for his ouster. On Dec. 30, 1947, while the king was preparing for a New Year’s party at Peles Castle in Sinaia, north of Bucharest, when he was summoned to the capital by government leaders. "It was the end of the year. My secretary called up from Bucharest and said, Groza would like to see you as quick as possible... because they wanted to talk about a ‘family problem,’” he told on a BBC interview. “ We had just come back from Switzerland, and my future wife and I had just got engaged, so I thought they wanted to talk about that," he said. When he entered Elisabeta Palace in Bucharest, he found the palace surrounded by Communist troops. Groza and Communist Party leader Gheorghe Gheorghiu-Dej were waiting for him and demanded that he sign a pre-typed instrument of abdication. Either Groza or Gheorghiu-Dej held the king at gun point forcing him to sign the document. Michael was helpless. He wanted to call to his troops for help but the telephone lines were cut off. That same day, the Communist-dominated government proclaimed the People's Republic, broadcasting the King's pre-recorded abdication speech. On January 3, 1948, Michael was forced to leave the country, the last monarch behind the Iron Curtain to lose his throne. King Michael narrated that Groza warned him that the government would kill 1,000 arrested students, if he did not abdicate. In an interview with The New York Times from 2007, Michael recalls the events: "It was blackmail. They said, 'If you don't sign this immediately we are obliged' — why obliged I don't know — 'to kill more than 1,000 students' that they had in prison." Some accounts, however, contended the king’s claim. In his autobiography, former head of the Soviet intelligence agency NKVD, Major General Pavel Sudoplatov wrote that the Deputy Soviet Foreign Commissar Andrey Vyshinsky personally negotiated with King Michael for his abdication, who was assured that he would paid to Michael in Mexico. Also, some articles in Jurnalul Naţional reported that negotiations with the Communist government guaranteed that the former king could leave Romania with all the goods he asked for, including gold and rubies. He was also allowed to bring with him a retinue of servants as he departed Romania. Albanian Communist leader Enver Hoxha and Soviet leader Nikita Khrushchev who recalled Gheorghiu-Dej's confessions also seconded these claims. King Michael met his future wife, Princess Anne of Bourbon-Parma for the first time in November 1947 when he was in London to attend the wedding of Princess Elizabeth and Philip Mountbatten. Anne, born in 1923, was the “independent-minded” daughter of Prince Rene of Bourbon-Parma and Princess Margaret of Denmark. She was later praised “as one of the most important symbols of wisdom, dignity and, especially, as a model of moral conduct." The two were unexpectedly introduced at Claridge's, where Anne was to meet her parents. Surprised, she accidentally clicked her heels rather than offer the curtsey. The embarrassed and unassuming princess fled the scene. 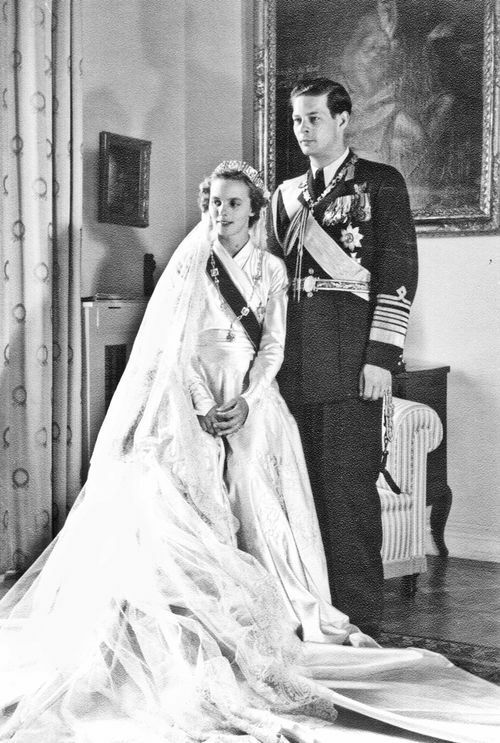 King Michael and Princess Anne of Bourbon-Parma during their wedding day. The King saw Anne once more that night at the Luxembourg embassy soirée. After that, they met several times in London, but Anne was accompanied either by her mother or brother. Michael proposed for marriage a few weeks later but they did not announce their engagement until Michael informed the government. Anne heard little of Michael until they finally met in Davos on January 23, 1948. Despite issues regarding the couple’s religion, their wedding went ahead and was celebrated at the Royal Palace in Greece on June 10, 1948, graced by royalties from around Europe. They had four daughters: Margarita, Elena, Irina, Sophie and Marie. Since Michael could no longer return to Romania, the couple settled in Hertfordshire, where they let a friend’s home. They worked as market gardeners until they became poultry farmers. When their business failed, they moved to Versoix on Lake Geneva in 1956. Here, Michael worked as a test pilot for William Lear of Lear Jets until he opened his own electronics firm. Michael also tried his hand as a stockbroker representing many European and American firms. In 1989, Communism was overthrown in Romania and on December 25, 1990, Michael, together with several members of the Royal Family, entered the country for the first time in 43 years. However, police officers intercepted them on their to Curtea de Argeș only to be forced to leave the country. He successfully returned to Romania in 1992 for Easter celebrations, where his speech from a hotel room drew over a million people. His popularity was a cause for concern to the government of President Ion Iliescu who forbade him to reenter the country. Finally, in 1997, the government restored his citizenship and gave him permissions to return home. He was given an official residence and staff in 2001, a privilege accorded to former Romanian heads of state. The government also returned the royal family’s confiscated properties and he and his family were permitted to use Elisabeta Palace in Bucharest. On his 90th birthday, Michael delivered a speech to the Romanian parliament, the first-ever in 60 years, where he urged the country to move on from the bad political habits of the past. “Eighty-four years since I became King, I can say without hesitation to the Romanian nation: After freedom and democracy, the most important things to be gained are identity and dignity. Here a major responsibility rests upon the Romanian elite,” so he said (source). Everyone around stood to give him their deafening applause. That same year, the government granted him the same rights as other former heads of state. An opinion poll in January 2012 ranked him as the most trusted public figure in Romania, a feat that no Romanian political leader achieved. On his 91st birthday, a grateful nation renamed a square in Bucharest in his honor. The man who endured war, betrayal, and personal setbacks almost his entire life at last earned the esteem and adulation of a country that finally came to accept him. 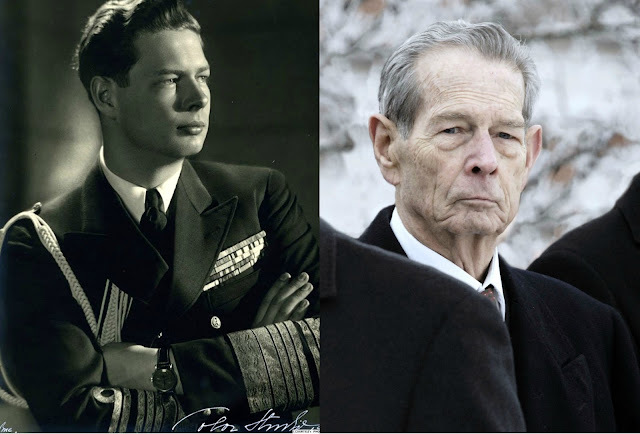 King Michael I of Romania died on December, 5, 2015, on his home in Switzerland. He was interred at Curtea de Arges. Deletant, Denis (2013). Review of The History of the Holocaust in Romania by Jean Ancel, pp. 502–506 from Holocaust and Genocide Studies, Vol. 27, Issue 3. Mandache, Diana. (2011, October 25). King Michael of Romania Parliament’s speech, 25 October 2011. Murphy, B. (2017, Dec.5).Michael I, last king of Romania and a Cold War exile, dies at 96. Washington Post. Thorpe, Nick. (2011, October 25). 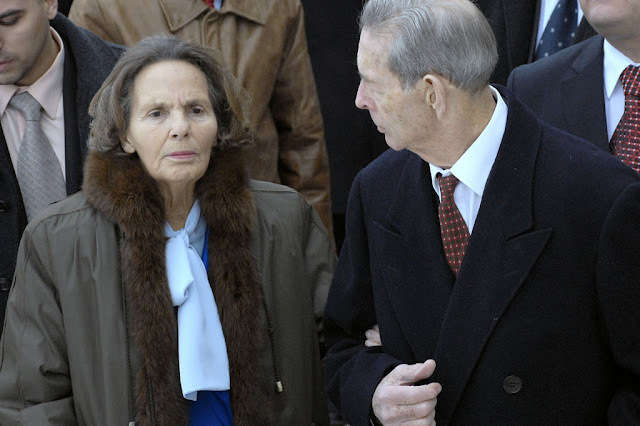 Romania's ex-King Michael I defends his wartime record. BBC.